Union Hospital employees and members of the community gathered to celebrate diversity Wednesday (April 1), during the Colors of Our Community Cultural Fair. The fair, put on by two Indiana State University graduate students, was set up to provide hospital employees and community members with knowledge about other cultures. Yi Chew and Pei Hsuan Sun, both studying human resources at Indiana State, have been interning for the hospital. As part of their internship, the two put together the event for the hospital's Employee Satisfaction Team. "We have been planning this event since January," said Yi Chew. "We wanted to provide an opportunity for health care professionals and the community to gain a basic understanding of different cultures and the differences between them." The fair, which included a fashion show, booths and food from 11 different international organizations from ISU and a traditional Saudi Arabian dance performance, brought in people from all over to the hospital. Sheri Kelty, a hospital employee in the human resources department watched the fair develop and said she was more than happy to see all of the cultures come together. "What's not to like?" said Kelty. "It's fun to see the different cultures, the food is good, too." Teja Kancharlapalli, a 2007 ISU graduate, said it was a very important event. "There is such an array of cultures all in one place and so many activities to participate in, it's a wonderful thing," said Kancharlapalli. The different booths set up around the room were full of information and offered a chance for people to get a taste of each culture. 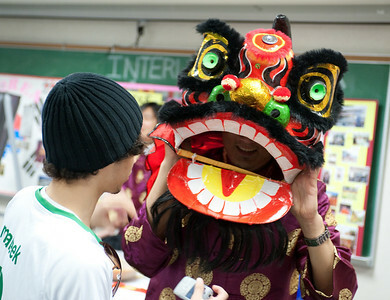 Some of the countries represented in the fair were Korea, Saudi Arabia, China, Nigeria, Morocco, India, Costa Rica and Taiwan. The Colors of Our Community Cultural Fair at Union Hospital, designed by two ISU graduate students, offered a look at traditions from around the world.